It is easy to fill your day here. Walk the beach (you will often have it all to yourself), swim, surf or snorkel. Beautiful Grant's Lagoon provides opportunities for bird watching and warm water paddling. Or just relax with a cuppa, a good book and take in the view. Stunning! Easily deserving of its 5 stars - is really a 6-star! Absolutely stunning location and house. Everything great in the kitchen too - excellent implements and crockery - and we were delighted to put the fire on for ambience primarily but was also nice and warm as the evening cooled. A real 5 star! Lynne our host was also always helpful. This house is amazing. 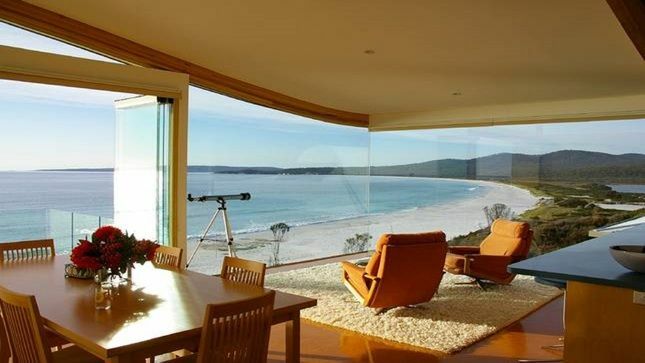 It has sensational views and everything you could possibly want or need. It was, by far, the best stocked kitchen I've ever seen in a holiday home. The host was also very helpful. We loved every minute of it, and wished we had stayed longer. What a wonderful place to soak up the beauty of NE Tassie. Sitting virtually over the beach you can watch sea eagles glide by, wander down to the extraordinary beach for swim/surf/walk, and then enjoy a hot outside shower, spa and a relax in a setting that is second to none. Thanks to Lynne for making the booking and stay so easy. This property has incredible views and everything you could want in accommodation. The pantry is stocked with all the little extras that make it feel like home and the furnishings and feel of the house is luxurious. Everything was incredibly clean and Lynne was extremely helpful and made us feel welcome even before we arrived. Access to the beach is straight through the back gate. Eden is an absolutely stunning home that I can't recommend highly enough. As a group of young professionals who struggle to get away, our much needed weekend escape couldn't have been more perfect. Waking up to the view of crystal blue waters and white sand beaches was pure bliss! Our stay allowed us to unwind and disconnect from our busy lives and the house had all the comforts we needed for a luxurious girls weekend. Couldn't recommend the place more highly. It's the perfect holiday house to be enjoyed at any time of the year and we can't wait to come back again!